The aroma is amazing! Traditional trdelníks roasting over burning embers at Trdelnik in Prague. When I received messages from Anne in Washington DC and Amy in California about a new taste sensation in Prague, alternately called a "Donut Ice Cream Cone" by Mashable and a "Franken-Cone" by NPR, I knew it was time to do some serious trdelníky tasting. To better appreciate the innovative donut cone, it helps to have an understanding of the traditional trdelník. Unable to resist the tantalizing aromas of roasting pastry lightly dusted with sugar and cinnamon, I sampled my first one at the Christmas Market shortly after we arrived in Prague. 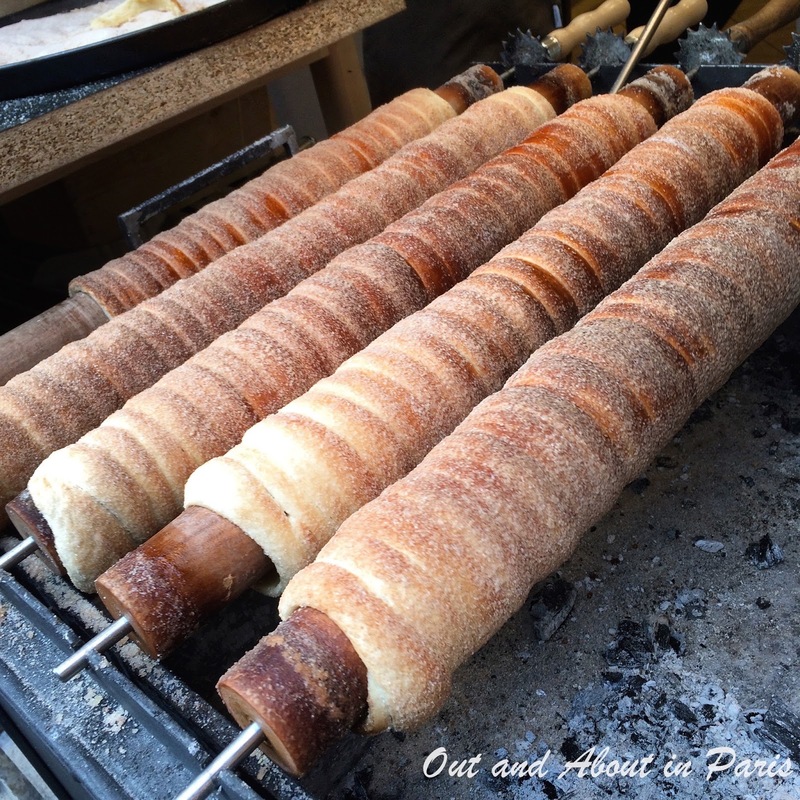 Crunchy on the outside, soft and doughy on the inside, the trdelník reminded me of roasting dough wrapped around a stick over a campfire when I was a child. It's comfort food at its best! 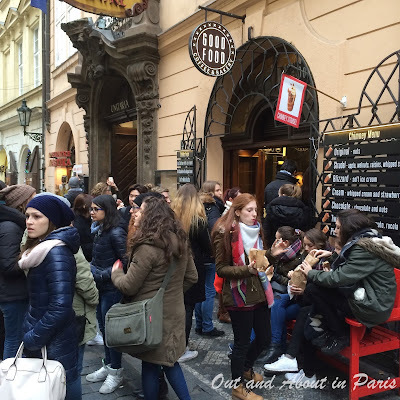 According to The Old Bohemian Trdelník Story, an interesting article by Clare Speak in Bridge magazine, "One culinary tour guide, at Eating Prague food tours, told me that trdelníky are definitely not Czech, and actually come from Transylvania. Meanwhile, a restaurant owner told me the snack was probably imported, or just dreamt up, by the owners of Prague's Christmas Markets, as a way to make a quick profit, since the ingredients are so inexpensive". Regardless of its origin, I set off on a trdelníky tasting spree yesterday afternoon. Starting at Old Town Square, I wandered down one of the narrow cobblestone streets until the glorious scent of cinnamon and hot dough led me to my first stop, Krusta Bakery. 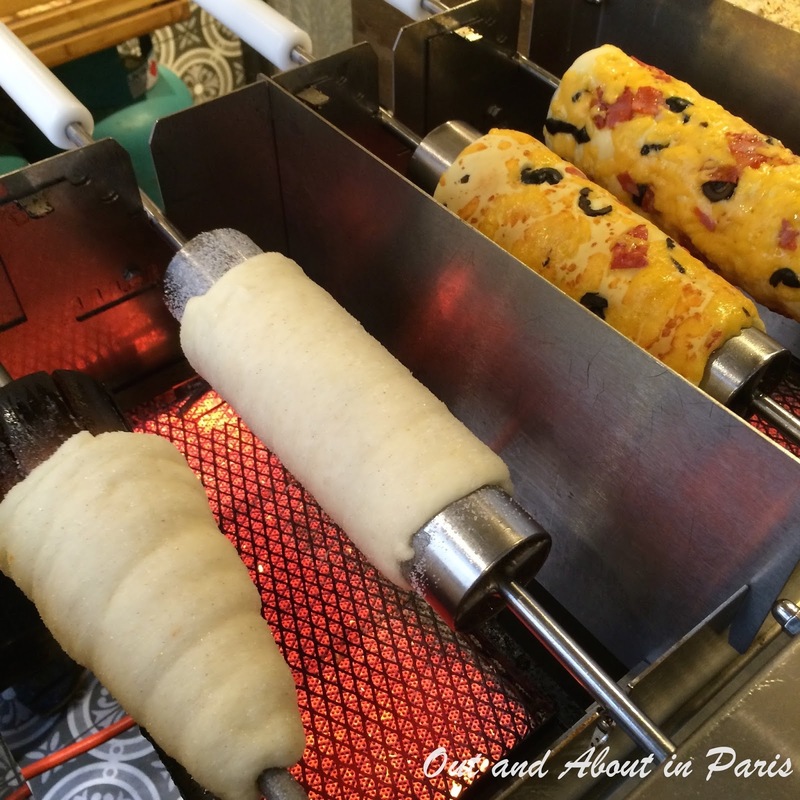 Roasted on metal, as opposed to traditional wooden rollers, Krusta's trdelník was mediocre. It was too thin and could have used a much more generous sprinkling of cinnamon and sugar. My next stop further down Karlova Street had a simple sign reading "Trdelnik" with a menu listing the options: chocolate, cinnamon, vanilla and apple and honey. Popping a portion of the steaming hot dough in my mouth, I reveled in the taste sensations. If you're looking for a traditional trdelník, this place is a good choice. Having acclimated my tastebuds to the flavors of original trdelníky, it was time to sample the version that has been creating such a buzz in the United States. The crowd of people gathered in front of Good Food Bakery made my destination easy to spot. While waiting in the long line, I had plenty of time to study the newfangled trdelník, rebranded as a Chimney Cake, at Good Food Bakery. 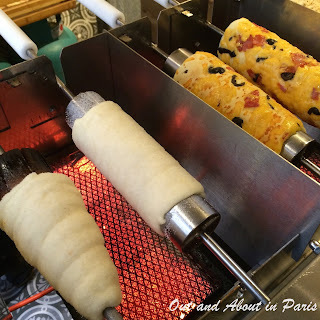 They had cleverly changed the form of the rollers so that the dough is tapered at one end. This innovative adaptation allows the cone to be filled with strudel (a mixture of apples, walnuts, raisins and whipped cream), ice cream or whipped cream and strawberries. 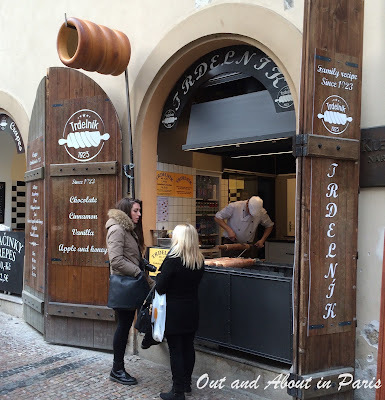 Taking the traditional tredelník one step further, Good Food also offers two savory versions. The Twister is stuffed with ham, cheese, tomato and rucola, while the Pizza is covered with cheese, ventricina and olives before it's roasted. When it was my turn, I hesitated between the Chimney Cake with ice-cream and the one with strawberries and whipped cream. While I would have preferred the latter, I went with the ice-cream because that's the one that has been causing such a sensation on social media. The trdelník, which was roasted over electric coils and not embers, was my favorite among the three I sampled yesterday. The proportion of nuts, sugar and cinnamon to dough was perfect. The soft serve ice-cream, however, was a disappointment. Rather than a pleasing vanilla flavor, it had an artificial taste. Thanks to some American women who were raving about their strawberries and whipped cream Chimney Cakes, I will return to Good Food Bakery to do some more "research". Plus, I'm curious to try their savory versions. If you would like to make trdelníky at home, the blog Chocolate, Chocolate and More features a recipe cleverly adapted to ovens. 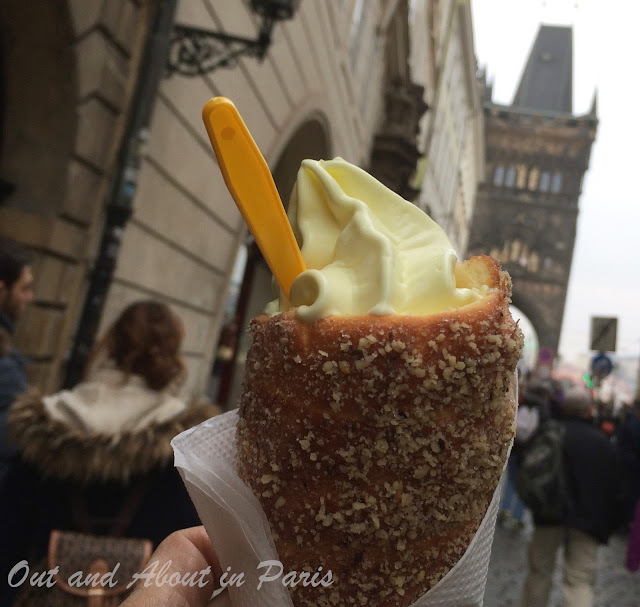 Good Food Bakery's trdelník, also known as a Chimney Cake and a Franken-Cone, is filled with ice cream. It's a hard job, but someone's got to do it! I think I've had these at Christmas markets, but they were indeed marketed as Romanian. Yours sound better though!